What would you say is THE color for bathrooms? I'm quite sure you will tell me white. And yes: white stands for purity, cleanness. White had quite a monopoly, at least for the sanitary ware, bathtubs, washbasins. Maybe the tiles could bring some touch of color in the bathroom. Safe option would be blue and green tones, they are refreshing, relaxing, calming. Slowly the trend is shifting from boring white bathroom sanitary ware to a more colorful one. Maybe you remember pictures of pink and light blue bathrooms from the first part of the last century? And that is not something you specially like...... no, colors are very refined now, the shapes are minimalist, the materials are innovative. We can well imagine that the first real bathrooms which made it into the homes were white, as dirt would show up best against a solid white backdrop. In the 20s Art Deco was bringing a shift in interior design. Color was introduced in the house after the dark years of war. Kitchen and bathrooms were getting, for the first time, more attention when they were decorating the house. The change didn't come overnight, manufacturers needed some courage to introduce sanitary objects in strong colors. Mid 1920's Kohler and Universal Sanitary manufacturing were starting to produce the complete range for bathrooms in colors. The first moments of the day we will spend in the bathroom, so we see why it is important to take care when decorating this room. The place which will fill us with good energy in the morning, and will unwind you in the evening after a tiring day at work. And don't forget that colors have power: to make you feel good, to energize, to relax. So choose wisely your color harmony, they can add a new dimension to your bathroom. And why not, think outside the box: pastel colors can look very modern when combined with black and white. You won't get to quickly bored of having to much color in the room when using a pastel color, but it can be to feminine, to sweet, to romantic. Black will give it a more masculin touch, works well in industrial style. Black in the bathroom as the complete opposite of white? This is not an easy choice, can be very stylish but it has a dark side. You will see every stain. Black is a good base if you want to turn your bathroom into an eclectic one. 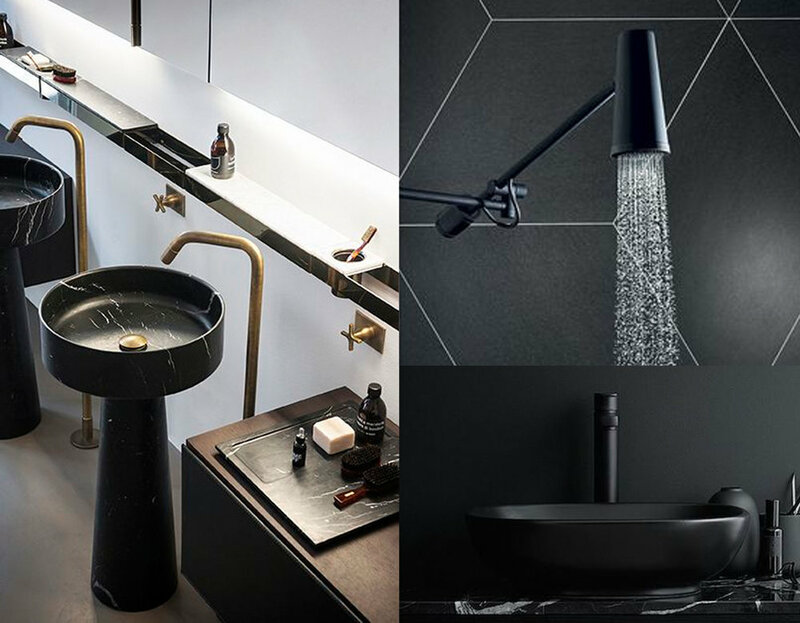 We don't see them often yet, the black faucets, but they are getting more and more popular. Pleasing the minimalist, the lovers of industrial style and fitting well in the Scandinavian style. When we think of color often strong colors come to our mind, and this would probably not be the best option for a bathroom. Strong colors can be refreshing in the living room, bedroom, and you can change them after a few years. Colorful accessories can be changed according to the season. When you start decorating your home you should know that the bathrooms and kitchen will be the most expensive rooms in the house. You will not change your bathroom every 5 years, so take care when choosing colors for the bathroom. Greyish pastel tones, muted colors, or neutral palet will all work well in time. Luxurious bathrooms are fitting well in a glamorous lifestyle. Manufacturers are thinking how to bring more comfort in the bathroom. And not only comfort, a luxurious touch, fitting with the rest of the house. Looking for innovative materials, bringing textiles in the room. I've never been a great fan of tiles in the bathroom, unless handmade, but this always comes with a certain price ticket. Also here we get more and more innovation done. Lately I've seen some great tiles in nice color range, beautiful finishes. Marmoreal, an engineered marble, is a very good and modern alternative for marble or stone in the bathroom. Can be used for floor and wall, comes in different dimensions and colors. Marmoreal is developed in collaboration with Max Lamb, a British designer. Two versions: white or black background in combination with four Italian marbles. The pre-cast terrazzo has a strong visual effect, combining fifteenth-century craft traditions with modern engineered-stone technologies. Color can be in the details if you can't say no to the idea of a white bathroom. A very young look you can create by using a colored cement to fill the grout. Colored furniture, the email on the outside of a free standing bathtub. So there are a lot of options to keep white in the bathroom and add enough color to make a statement. 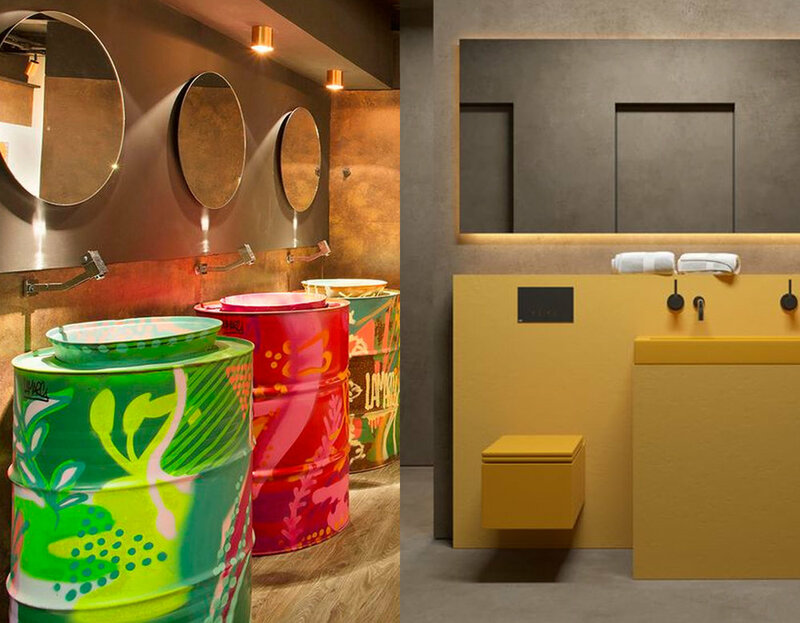 Use of strong colors can work well in restaurants and bars, it makes going to the bathroom an experience, but take care not to repeat this at home as it can be overwhelming. Unless pop art is your style. When going for a strong color than painting the walls in the exact same color can make it easier for the eye, all will blend int each other. Hand painted washbasin shows tradition, give it a timeless twist by combining it with something ultra modern as a shower tap in silicone rubber. This is for sure not something for a traditionalist, but the bohemians under you will love the idea. 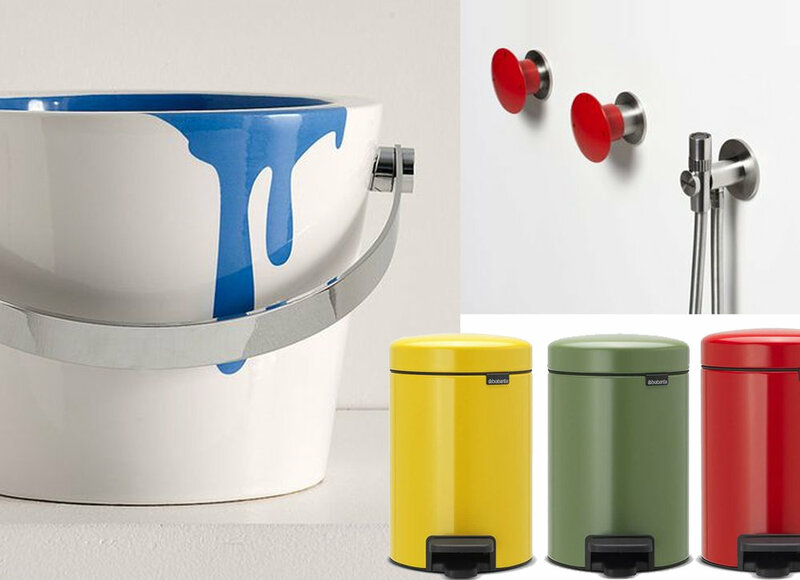 When colorful sanitary ware is to much for you, a touch of color can be the solution. You add some style, humor, joy, just by having some small color touches. Even a small bath rug, or your towels can be that item to change for a great impact. Chromotherapy is present in the bathroom since some years, it is getting more and more refined. Shower head integrated in the ceiling, the water falls directly from the ceiling, colored light all to bring you a complete feeling of wellness, involving all the senses.